On June 11, 2004, then-US president George HW Bush walked slowly down the centre aisle of Washington National Cathedral to eulogise my father, former president Ronald Reagan. Eulogies are difficult to compose. The best ones are a fine mingling of heart, humour and poignancy. 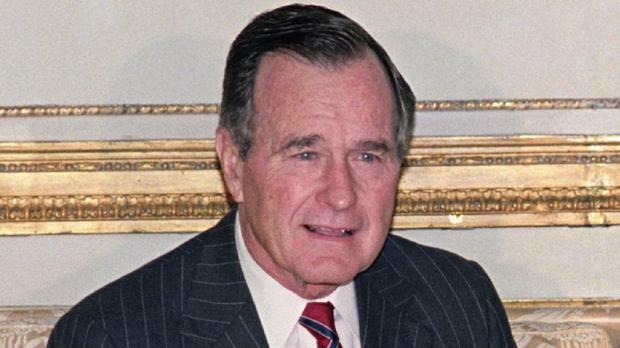 Bush spoke about the man who had touched his life. He spoke about my father's gentleness and humour, about his strength and his deep, abiding love for America. At one point, his voice broke as he fought back tears. "As his vice-president for eight years, I learned more from Ronald Reagan than from anyone I encountered in all my years of public life. I learned kindness - we all did. I learned courage - the nation did," he said. The tears he fought against brought my family and me to tears. It was one of those moments when you know that the person who is speaking is stripping his soul bare and letting you in. He also did what is so difficult to do in eulogies - he turned everyone's tears to laughter with humour. He recalled that when asked how his meeting with South African Bishop Desmond Tutu went, my father - playing on the bishop's name - responded, "So-so". America will lay to rest a man who served his country. We will pause, and mourn, and reflect. We might also want to mourn the loss of dignity that we have long associated with the office of the presidency and that is no longer there. No matter what you thought of George HW Bush's time in office, he never attacked or abused people or institutions. He was never crude or dismissive of people who were hurting. And he had reverence for the constitution and the pillars of democracy that built the American nation - the pillars that are now being chipped away, crudely and casually. He understood that peace is a fragile thing, and that to maintain it, nations have to work together, employ diplomacy and treat one another with respect. That tone is set by leaders. He spoke of "a better America... an endless enduring dream and a thousand points of light". President Donald Trump once mocked that vision, but his mockery cannot diminish the importance of Bush's words. What a beautiful image, encouraging people to aim for the heavens instead of grovelling in the shadows, inspiring people to leave a mark that lights up the darkness. My wish for the Bush family is that they look into the night sky and see 1,001 points of light.